It was so lovely to meet Michelle from Lily & Cino at the ABCD Meetup on Thursday night. Michelle is a very busy lady and runs a graphic design studio as well as producing a fantastic range of personalised stationery and greeting cards featuring her illustrations. The Lily & Cino range includes lovely wedding stationery, baby announcements, party invitations, moving announcements and the very clever 'dating cards'. Want my digits? You can customise your stationery with your name, monogram, a special logo and text and here is the killer feature - you can save your designs on the website! 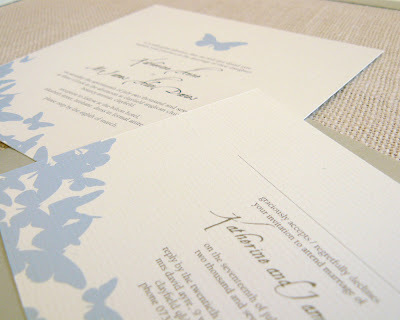 I love the damask design which is so hip right now, and the butterflies are super sweet. 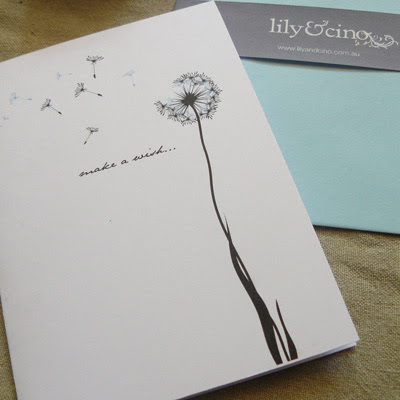 You can find Lily & Cino custom stationery via the website. Check out Michelle's graphic design services on the Lily & Cino Studio site, and peruse Michelle's cool finds on her blog A Lily In Bloom. That dandelion card is breathtaking! I love it. Great find Steph! Hi Jess, glad you like! So much great talent coming out of Brisbane. Have a lovely Easter.